The annual ShelfLife magazine top 100 is like the Olympics for FMCG. Each year the list ranks the top performing brands in the Irish market. It is usually dominated by household names like Coca Cola, Brennan’s bread and Avonmore Milk. To be listed in the top 100 is a real achievement for an up and coming brand. They also publish a Top 10 Movers and Shakers list for growing brands. And this year we are delighted to see that two of our clients are ranked in third and fourth place respectively. 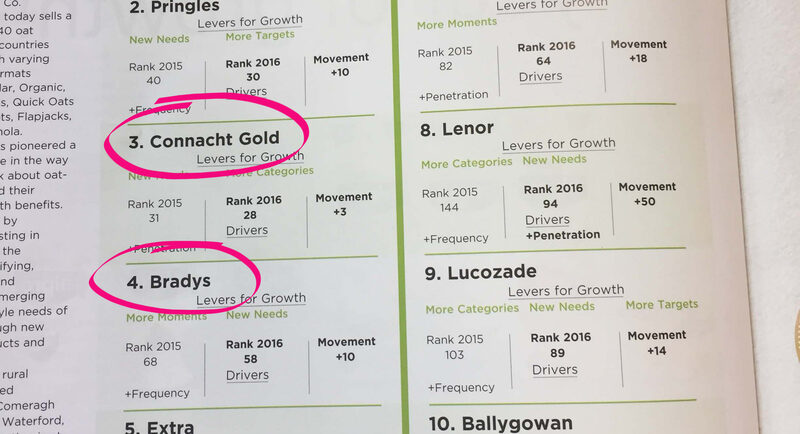 In fact, Connacht Gold and Brady Family Ham are the highest placed Irish brands in the top 10. So well done to all the Connacht Gold team in Sligo and Ballaghdereen and to all the Bradys team in Timahoe, Co. Kildare – we are delighted to have played a part in your challenger brand journey so far.